Guess what? I've been working on Narratopia again. 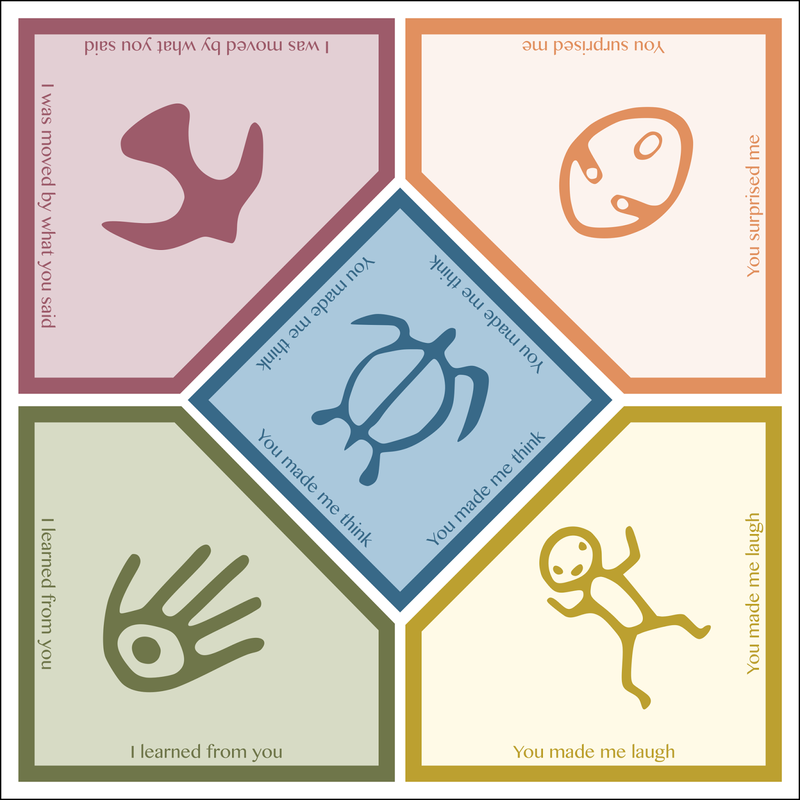 In case you don't know: Narratopia is a game of conversational story sharing for 3-6 people. 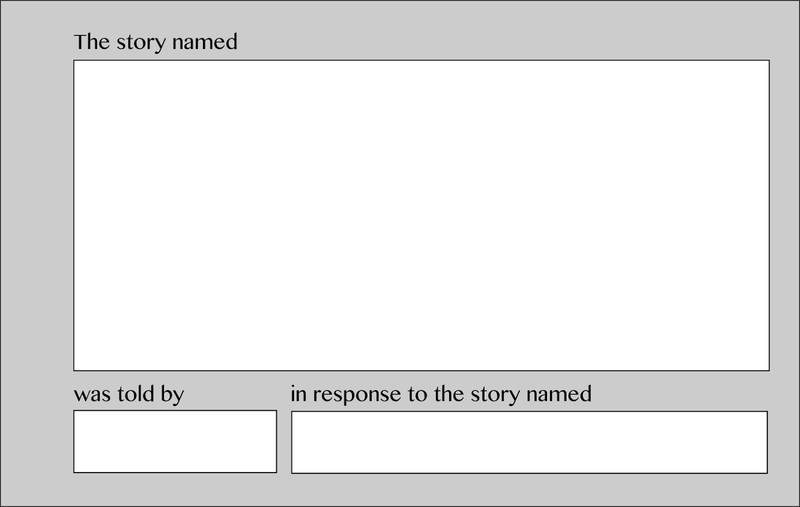 You build a web of connected stories about anything you like. You go on a journey of discovery by exploring experiences and connections. 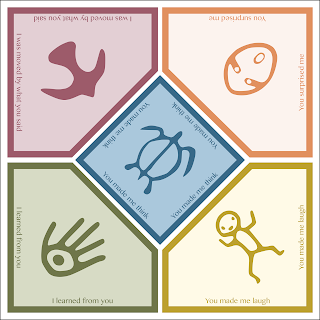 The game helps out by giving you ideas for questions to ask, connections to make between stories, and tokens of appreciation to give each other. This blog post is about the design of Narratopia's third edition. If you don't care about the details and just want to see what Narratopia looks like now, watch this video. Now, for the curious, let's get into the details of the redesign. When I came back and took a good look at Narratopia, my first thought was: it's so cluttered. 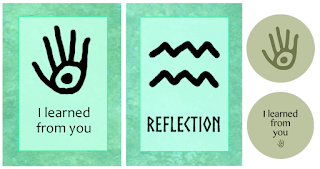 I was trying to get across certain themes and messages, but I tried to pack in too much. What the game needed was simplicity: of concept, design, gameplay. So I set myself the task of removing every obstacle that held people back from being immediately able to understand the game, play it, enjoy it, and remember it fondly. First I'll talk about the game's visual design. 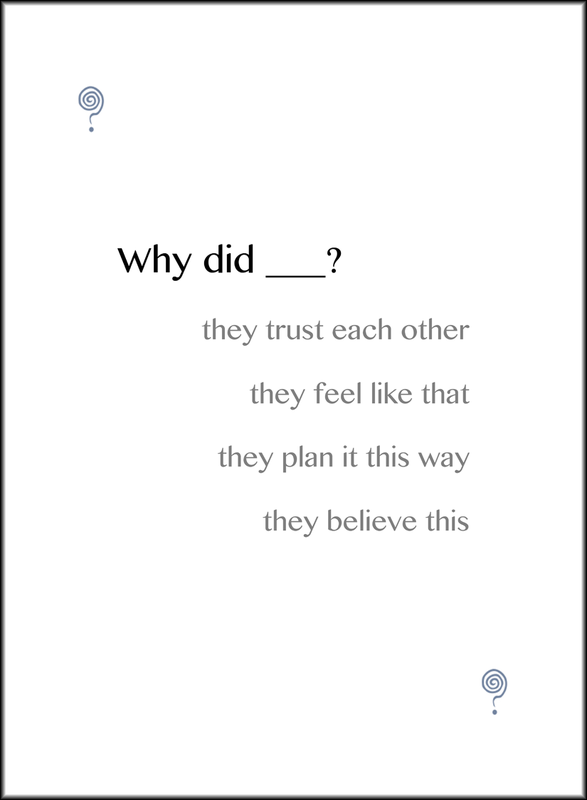 Here are the backs of the question cards in all three editions of the game. And the game's connection cards (which link stories together). Narratopia's theme has always been about hearkening back to a past in which we habitually shared more of our own stories. In the first version I went back only a few centuries. As you may recall from my last blog post on this topic, that didn't work well. People thought the game was about fine art, or museums, or history. So for the second version I went back further, into the prehistoric past. This was a good idea in principle, but I cluttered up the visual presentation. What happened was, I went looking for pictures of rocks, and I found a nice photograph of a rock with pine needles and pine cones around it. 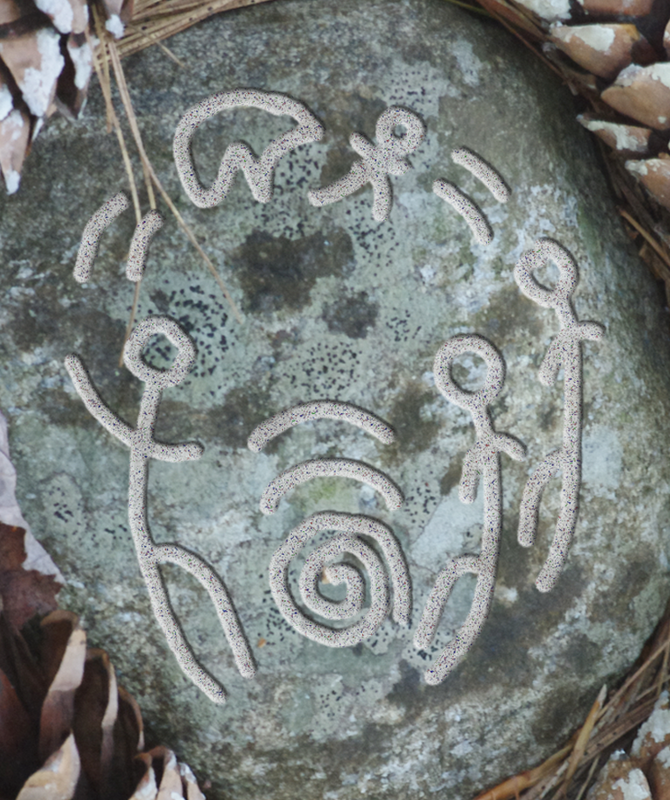 I thought if I drew something on the rock, it would convey a sense of discovering something ancient and valuable. But my message was lost in too many layers of conflicting meanings. 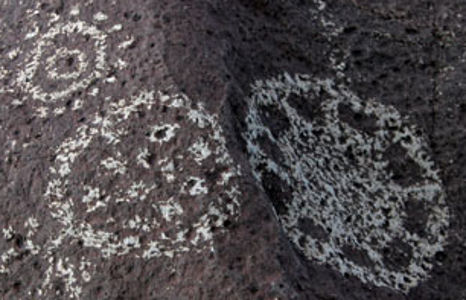 The drawing on the rock was hard to make out, and people were more likely to think the game was about appreciating nature than to see it as discovering something ancient. 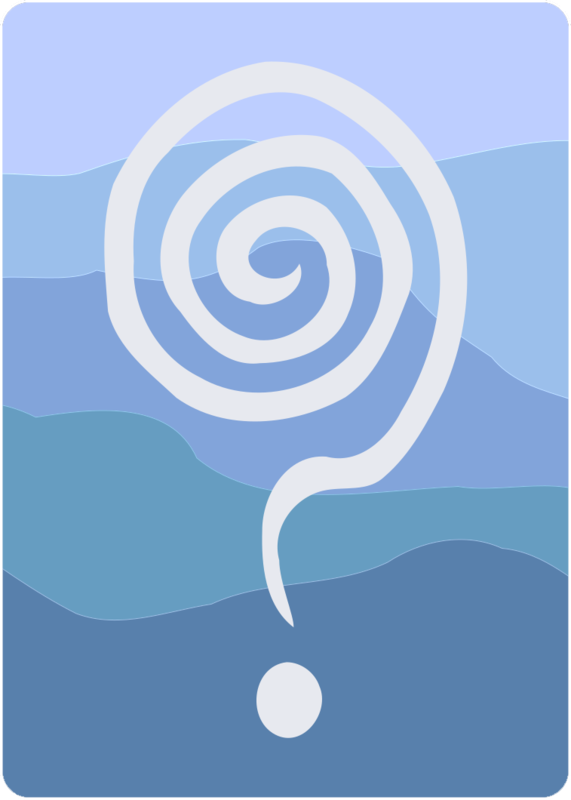 It seemed to me the perfect symbol of a connection, so I copied it for the connection card, then simplified it some more. Previously I had been using an image of an arrow for connections, but that was too one-sided. An intermingling of two stories, like a handshake or embrace, was a better image for a narrative connection. 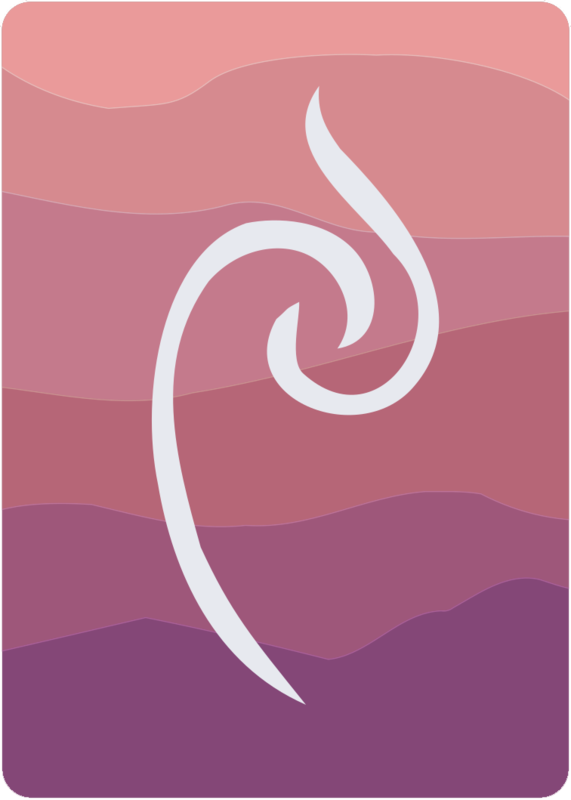 I think - I hope - the new card backs evoke timeless symbols and natural patterns while being clear about what they represent. 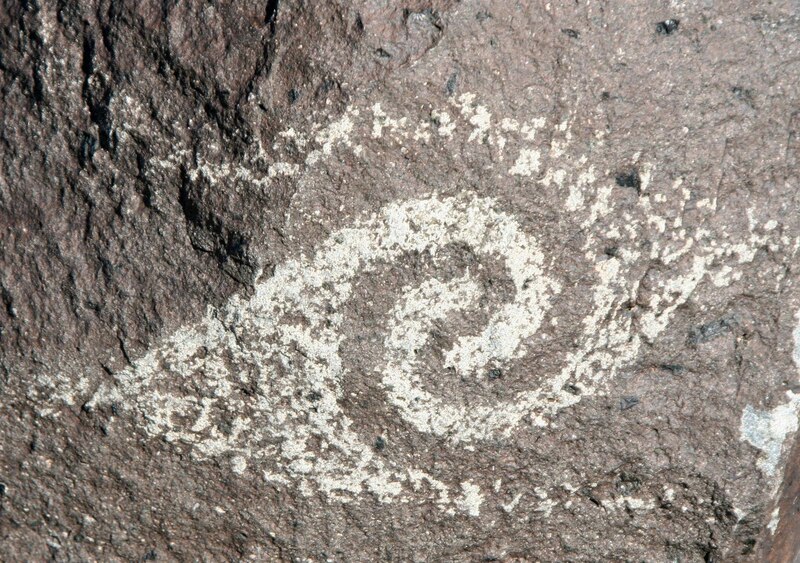 The color gradations on the cards came from noticing that most of the petroglyphs I saw were carved or painted onto rock faces with subtle gradations in color, often in horizontal bands. In fact, I sampled the colors for the card backs directly from two photographs whose colors I particularly liked, one a pale blue-grey boulder, the other a reddish-brown cliff face. Okay, so we've covered the card backs. Let's move on to the box. These are the three box fronts. I don't think very many people got what I was trying to put into that image. I would say, "See, this is a campfire, and this person is telling a story about a bear, and these people are hearing it" - and they'd say "Ohhh, I see it," in that polite way that meant they hadn't seen it before I said that. 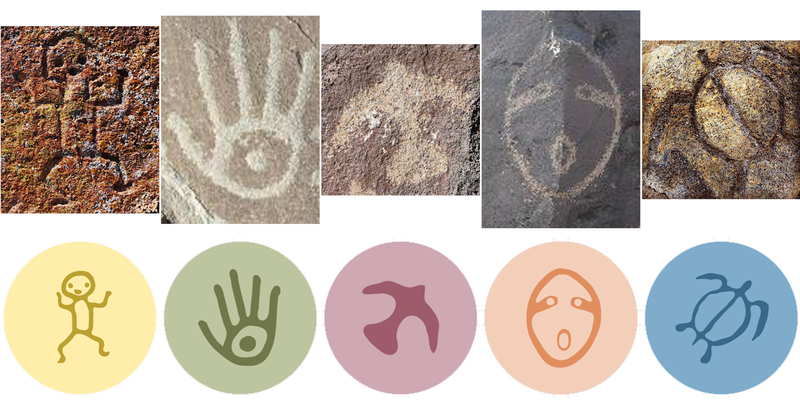 So for the new box design, I looked through more petroglyph images for a simpler symbol that could represent story sharing. In petroglyphs and cave art there are many symbols of radiating energy, possibly representing the sun or fire. 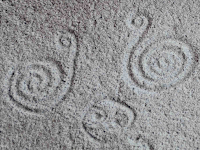 Some have rays; some have dots; some have spirals; some have concentric circles; some have sections like an orange. 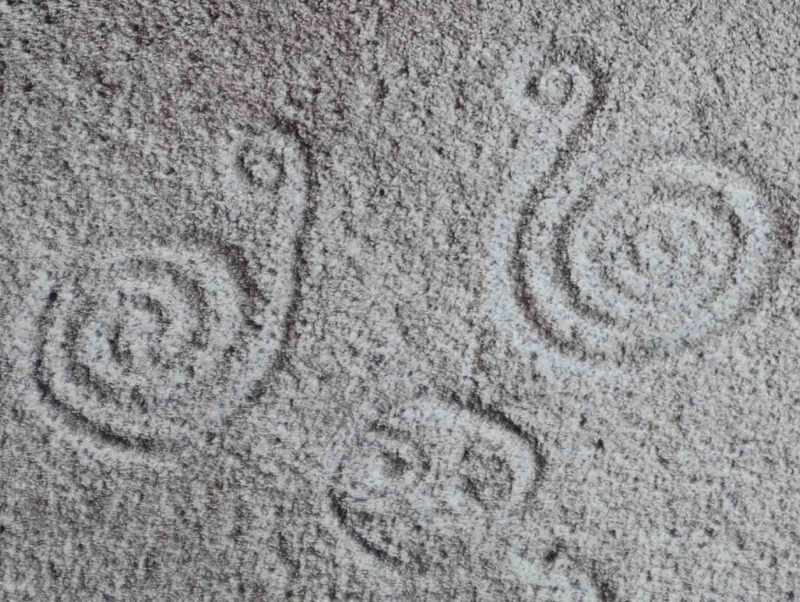 So I thought, why not simplify my drawing of people around a fire to dots around a spiral? 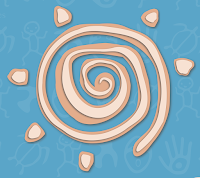 That might communicate the concept of energy or warmth in the center of a group. Another thing about the box: in the first and second editions of the game, I used inexpensive boxes made of flimsy cardboard. That didn't work out well. The game box seemed to warp after you took everything out and put it back a few times. So this time I opted for a nicer box with thicker cardboard. It costs more ($10 instead of $6) but I think it's worth it. So that covered the cards and box. The only thing left to simplify was the things people give each other after each story is told. 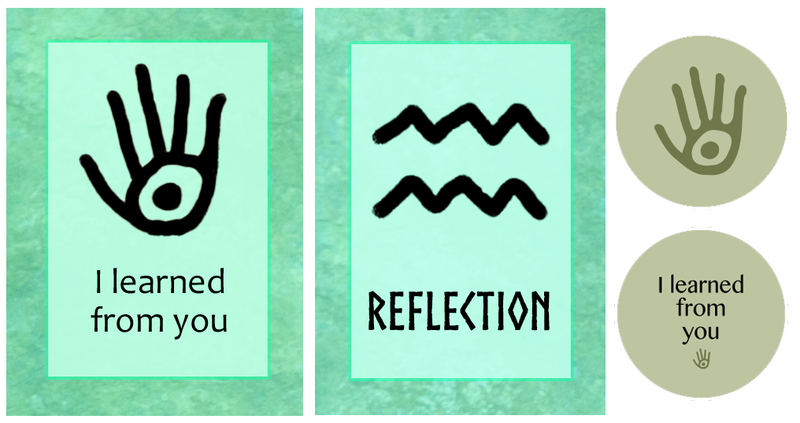 I had been calling the things reflection cards, because people were meant to reflect on the story. But again, that was too subtle a point, and people didn't understand it, and I grew to hate it. So I started thinking about how I could simplify the things-you-give as well. I had chosen to use small playing cards for the things-you-give because it seemed like every other option gave players a chore to do, such as to punch out tokens or put stickers on game pieces. I didn't think people would want to do chores. But the small cards turned out to be a mistake, for four reasons. Having three sets of playing cards was too confusing. Cards and cards and cards is too many kinds of cards. People still had a chore to do, because they had to sort the reflection cards, which came all jumbled together. So I wasn't saving them any trouble. I bought a bunch of card and board games to see what other people were doing, and I realized that quite a few games have punch-out things. Also, we didn't mind knocking the things out of the sheets they came in at all. In fact, it was kind of fun. It gave you a getting-ready feeling. So not only was I not saving people from a chore, I might have been taking something fun away from them. Most importantly, I realized that the shape of a playing card has meaning. People expect to do things with playing cards - take an action, build a suit, move a step. They don't expect to give cards as gifts. To use the cards I had in the way I intended, people had to forget what playing cards (in that shape) usually do and use them in a strange new way. I could see that people had a hard time understanding and remembering that. They would read the instructions and say, "We're supposed to give these cards to each other? Why?" 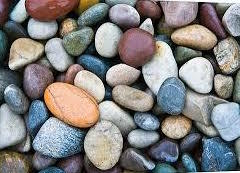 As I was thinking about these things, I kept thinking about river pebbles. You know those little round pebbles you find when you're out walking by a stream or a lake, and they're so beautiful you just have to bring a few home, and when you get them home they don't look nearly as pretty as they did in the water? Those. So I changed the reflection cards to little round punch-out tokens, and started calling them - guess what - "tokens." Now they look like this (showing both sides of each token). You do have to punch the tokens out of the sheets they come on (six per sheet), but it's ten times easier than I expected. I'm embarrassed that I didn't think of trying it before. I drew the new token colors directly from photographs of river pebbles, like this one. The colors are not very different than they were, but they're more earthy and natural looking, and I like how they complement each other. There's only one thing I don't like about the tokens now, and it is that they are tiny. They are three quarters of an inch in diameter. One-inch tokens would make the game cost an extra ten dollars, and they would be laser-cut, which apparently leaves soot around the edges and a strange smell. Of course, this problem will go away if I ever am able to move past print-on-demand, or if thegamecrafter.com (TGC) ever gets one-inch card-stock tokens. Even so, I wouldn't want the tokens to be bigger than, say, an inch and a quarter. They're nice small. They feel like things you should be passing around. Okay, so that's pretty much all of the changes that are primarily to visual design. Next are some gameplay improvements. I made five small changes to the game rules that simplify the cognitive structure of the game. 1. The number of questions. 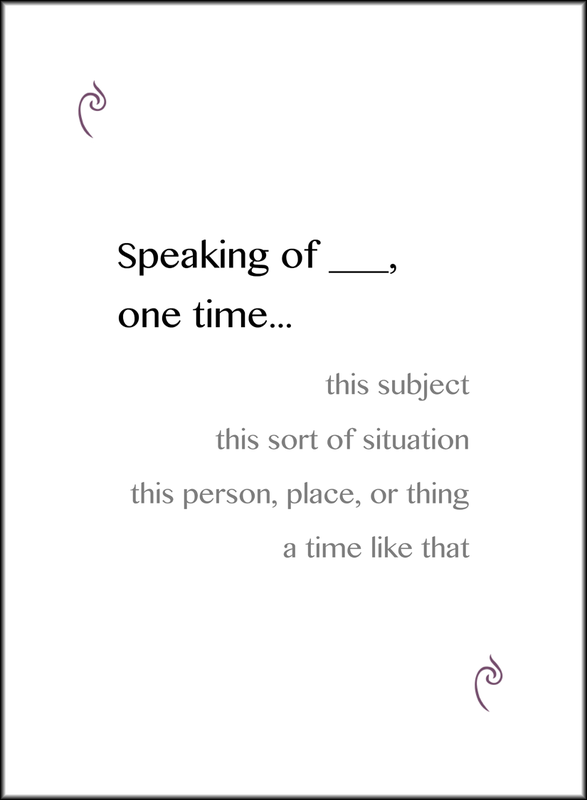 The instructions used to say that each player (other than the person whose turn it is) should ask "one or two" questions each about the story. I have now simplified the rule so that each player must ask exactly one question about the story. This trims away a decision point (how many questions should I ask? ), and it makes the game lighter and faster moving. 2. The number of tokens. The instructions used to say, "Any player can give any number of reflection cards (including none) to any other player." Apparently this was super confusing. People spent a lot of time figuring out how many tokens to give to whom. I even observed one group so flummoxed by this instruction that they ignored the reflection cards entirely. So I changed the rule to match the "one question per player" rule. 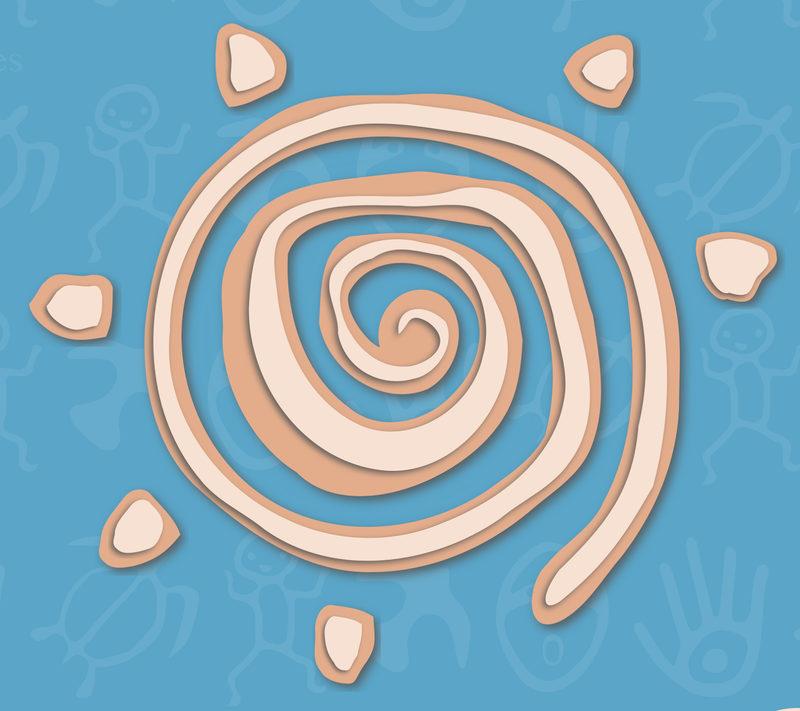 Now each player, including the storyteller, must give exactly one token to one other player. Contrary to my expectations, this restriction makes the game more enjoyable. No muss, no fuss, just pick up a token and bestow it. 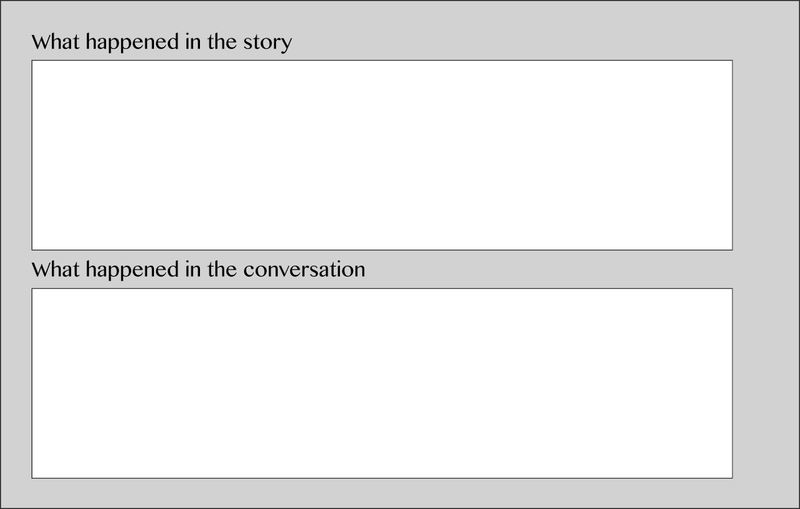 The new rule also makes it more clear that the storyteller must also choose a token to give out, which puts less emphasis on the story and more on the conversation. 3. Where the tokens are. The instructions used to say that you should give everyone a pile of tokens at the start of the game. As a result people ended up having to manage two piles of tokens: those they got at the start (and hadn't given out yet), and those they had received. Everybody got the piles mixed up. At the start of the game, instead of giving out tokens, you place them (sorted) on the token bank. Then people draw tokens from the bank to give to each other. This improves the game in three ways. It's nicer to deal out only two sets of cards at the start of the game. Before, I had to have all this messy stuff in the instructions about giving out 10 tokens each if there were 3-4 people and 15 tokens each if there were 5-6 people. With the token bank that problem goes away, because you can just put all the tokens on the bank and not worry about how many are left over. Most importantly, when I played the game like this, it felt better. I particularly liked the image of a bank of gratitude and appreciation sitting there waiting to be distributed. It created a feeling of anticipation for what was to come. I also increased the number of tokens from 90 to 150, because a greater variance in token choices creates more varied game endings. Before, your choices late in the game were governed by what types of tokens you had left. Now you are free to skew wildly in favor of one or two types of token. Six players giving one token each while six players tell three stories each will use 6x6x3=108 tokens, leaving 42 extra that nobody chose. That means if nobody ever chooses a "you made me think" token (for example), you still won't run out of tokens to give out. Of course three players will have far more tokens than they can use (3x3x3=27), but it won't matter because of the token bank. You never use all the Monopoly money either. 4. The number of cards. 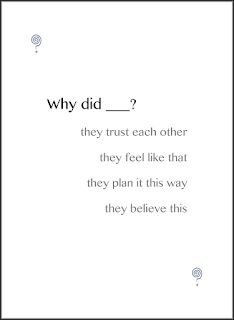 Because people don't have to come up with two questions per story anymore (or decide whether to ask two questions), people don't need as many question cards. So instead of five question cards and three connection cards, I've changed it so that people get four cards of each type. That's one less thing to remember and more brain power left over. 5. Trading cards. The instructions used to say that you could trade in one connection card per turn, and one question card on anybody's turn. This was to help people find better matches, because people kept complaining that they couldn't find good matches. But the trade-in rules were confusing, and hardly anybody remembered to use them. Because of the other simplifications above, and because of something else I'll tell you about later, I don't think the game needs this rule anymore. These small changes don't alter the essentials of the game, but they make it run more smoothly. Trimming away unnecessary decisions frees up more mental capacity to enjoy the interactions between players, which are the heart of the game. Every time I removed one of these cluttery ambivalences, I could feel the game breathe more freely. I can see now that in my first sets of instructions I spent too much time bothering people with uncertainty. What they needed was a clear and simple set of rules that would help them get started fast and keep moving. It took me a long time to understand that game instructions do not define how a game should be played. They represent the start of negotiations about how a game should be played. When people play a board or card game, they read the rules, and they might play the game that way for a while, but eventually most people diverge into whatever way of playing the game suits them best, and they don't need the game's permission to do that. I was trying too hard to give people permission to make Narratopia work for them, but they already had permission, and my attempts to make the game flexible made it confusing. With these simplifications to the gameplay, the game feels lighter, less complicated, and more flexible. Some of the people who played the game saw those blank spaces and immediately thought of a dozen things to put into them. I did that, and my son did that, and two of my sisters did that. It seemed to us that everyone ought to find it easy to do that. But not everyone found it easy. My husband and another one of my sisters had a terrible time getting over the blank-spaces hurdle and enjoying the game. They weren't inspired by the blank spaces; they were frustrated. I saw a similar range of reactions in the other people I watched play the game. 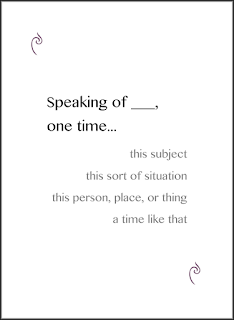 These extra texts don't fill in the blanks on their own, but they help people by marking out some of the types of things they might fill in the blanks with. They send people down avenues of exploration. As I said, I did this tentatively, as an experiment. However, the value of it was immediately obvious in two places: the relief on my husband's face when he saw it, and my next look at the game's instruction sheet. I had all sorts of crutches in there for the filling-in-the-blanks hurdle: examples, reminders, encouragements, exhortations. By adding suggestions to the cards, I was able to cut the game's instructions in half. Anything that reduces how much you have to explain about a game has to be a good thing. So I'm happy about the new suggestions. All of the cards with blank spaces have them (that's about half of the connection cards, and all of the question cards). Here's a connection card. For those who need them, the suggestions are in the right place at the right time. Those who don't need the suggestions can ignore them, since they're small and pale and off to the side. When I played the game with the suggestions, I found that I ignored them most of the time. But when I couldn't decide which question or connection card to use, I read the suggestions to get more ideas. That was just what I meant them to do. They do add more words to the game, which seems like a complication, but they simplify the gameplay by helping people over little snags that come up as they connect things together. Also notice the improved card fronts. I don't know what I was doing before with those borders and patterns and colors. This is simpler, and the paired symbols look more like what people expect playing cards to look like. They also make it easy to find cards that are upside-down, because the little symbols are upside-down too. The color gradations on the card backs serve the same purpose (that was a happy accident). I also reduced the number of cards of each type (question and connection) from 50 to 42. The number of cards of each type originally started out at 24 and gradually increased (because people said they wanted more) to 50. But recently someone told me that some of the cards seemed too similar to each other. So I went back through the cards and tried to justify each one. Any card that I could not make the case for including - because it was uniquely useful - had to go. It just so happened that the number of cards I could justify in each case was 42. Why did I do this? Because I watched a fascinating series of videos in which three game buffs sat around talking about what they loved and hated about board and card games. One of the guys talked about how in any game there's a time when you're sitting there waiting for somebody else to do something, and you need something interesting to do while you're waiting. I asked myself what Narratopia had to offer someone in this situation, and I came up with nothing. Then I remembered how much people love hearing about the research on conversational storytelling. People always say it gives them a whole new appreciation for stories in everyday life. So why not give players a chance to enjoy the game even more by learning about the ancient ritual they're participating in while they play? I think it will make the game more enjoyable. And because it's optional, it won't get in the way. I've saved my favorite improvement for last. This idea grew out of four things that happened over the past few years. I'll try to get them into chronological order. Every time my husband and son and I played Narratopia, after the game, I would pick up the story names we had written and feel a little sense of loss. I did keep the pieces of paper with story names on them, but I didn't have any sense that I would be able to get anything out of looking at them again. They were too fragmentary to mean much. At a family get-together more than two years ago, I managed to get both of my parents and two of my sisters to play Narratopia with me. They gave me some great ideas. But the most important thing about that game, to me, was that my dad played it. After he died, I racked my brain to remember the stories he told, but I just couldn't remember them. I still can't. I wish I could. On a story project I worked on two summers ago, I had some extra space left over on a story form (on paper). To fill up the page, I wrote, "You can write some notes on the story if you want to here." I didn't think anybody would write anything; I just didn't want the form to look incomplete. 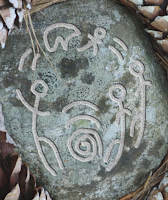 I was surprised to see that quite a few people wrote down their whole story in the space, even though they knew we had recorded the story as they told it and would be transcribing it. I watched some of the people as they did this. There was an energy to their concentration that is hard to describe. They seemed to have a hunger to get their stories written down. I began to wonder if we all have a hunger to get our stories written down, not for the world, but for ourselves and our families. We take a million pictures, but most of us never write down our stories. One day a few months ago, I needed a piece of paper. I went rummaging through some drawers and found a notepad that was mostly used up. While looking through it for an empty page, I came across some scores from a game of gin rummy we had played some time before. As I looked at it, I felt this surge of happiness, just remembering the fun time we had. 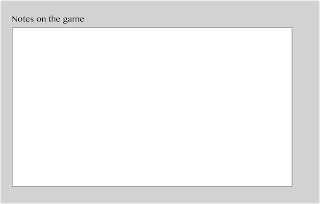 Putting all of this together, I realized what was missing from Narratopia: a way to remember the game after it ends, after the moment is gone, maybe after the people who played it are gone. I said in the game instructions that people could make an audio or video recording of the game, but I knew when I wrote it that nobody would actually do that. The game needed a way to help people create a record, an account, a keepsake of the stories they told and the conversation they had. And the method of doing this couldn't be complicated or difficult. It had to be an easy, simple, natural part of the game itself. 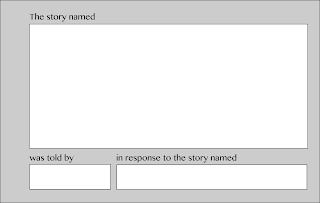 This second side of the form will not be filled in during gameplay. People will fill it in just after the game has finished. I tried this after one game, and it was deeply satisfying. It scratched the itch I've been feeling about this game for a long time. The back of the game form just has an open space to record any notes on the game itself. I'm also adding ten plastic zipper bags that people can use to package their story forms into little bundles of memories they can keep in the game box and rediscover years later. My first bundle of story forms is sitting in my kitchen right now. I keep glancing at it as I walk by. This is the first time in all of the Narratopia games we've played in our house that I have something to look back on. I'm so glad to have it. Writing down the gists of the stories (and some of the questions and answers) only took me a few minutes, and it was fun to do. I think at least one person out of most groups will be interested in doing this. Of course, some people will not want to "make a memory" while playing a game, but that's all right; they can just ignore the backs of the story forms. For people who want to remember, this will make the game much more valuable. 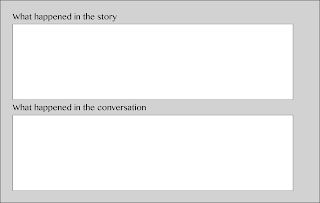 Edit: After vacillating about that must-include-180-story-forms thing for weeks, I've switched back one more time and removed 80 of the story forms. This reduces the price of the forms to $10.46 and the overall price to $44.99. 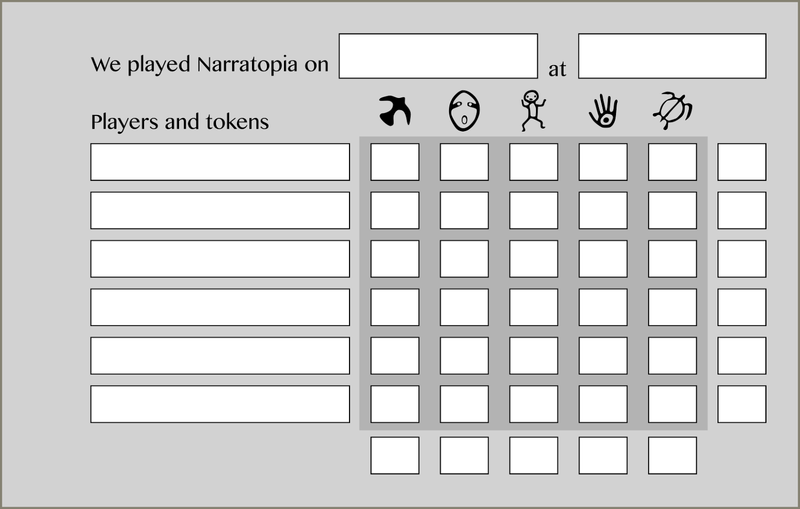 Now you can only play five games with six people before running out of story forms, but I've added the print-and-play file to the downloads (after purchase) so you can print as many more as you need. The $50.99 price just seemed too cringe-worthy. However, I've decided that trying to keep the game cost down has been (paradoxically) keeping the game from moving forward, because I haven't been able to make it look and feel the way it should to succeed. These high costs are entirely due to the game being produced on demand in a small shop that prints every game with custom settings. If I was able to order hundreds of games, the cost would be much lower. Even TGC shows me a bulk cost (for 100 or more games) of $34.16 (now $30.56). To help with the high cost, I have created a print-and-play version of the game and am selling it for $8 (I will get $5.74 of that, so that's a good thing). All right, so here's where we stand now. I have updated the web site for the new game design, and the new game version is available for purchase (in print and print-and-play versions) on TGC. And as you saw at the start of this post, I have a much improved video. I see four ways forward for the game at this point. It could continue as a niche product, printed one copy at a time by TGC, for essentially forever. I could do a Kickstarter and collect orders to run a bulk process through TGC. I would need at least 100 people to pre-order the game to do this. I could even repeat this process once or twice a year, while keeping the game available on TGC in between (for the higher price). I could do a larger print run, say of 500 or 1000 copies, and set them up with Amazon fulfillment. I could launch this with a Kickstarter as well. I could try to get a publisher to take on the game. I don't know which of these is best. All but the first depend on other people being interested in the game. The safest bet is to keep the game on TGC and wait to see what happens next. I think it's a good sign that I've sold 40-50 copies in a year and a half with exactly zero energy put into promotion and advertisement; but it's hard to know what that means about the future. I feel like the game needs more time to mature before it's ready for a big commitment (like a 1000-copy print run). Maybe a year from now I'll feel ready to take the plunge. What the game needs most now is credibility. I need people to say they like it in public. TGC has reviews, and places to link to published game reviews, but I don't have any of either yet. So here's where I need to reach out to you. If you have played Narratopia in the past and liked it, please consider posting a review on its thegamecrafter.com page. If you would like to write a review of Narratopia for a blog post or publication, send me an email (cfkurtz at cfkurtz dot com) and I'll send you a free copy of the game. You just have to promise to (a) actually write and publish a review (within a reasonable time frame), and (b) give me a link to your review and permission to quote a few sentences from it. A few of these reviews would give the game more of a presence. As before, I am also interested in producing expansion packs and translations of the game. If you are interested in either of those things and want to work together, let me know. And thanks for your interest in Narratopia!